One of the most fascinating stories in the history of Bacardi is the legend of ‘El Coco’. 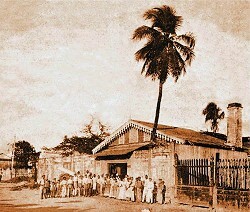 ‘El Coco’ was a coconut palm planted by Facundo Bacardí Moreau on the day his father, Don Facundo Bacardí Massó, purchased the first distillery, on February 4, 1862. As the palm tree took root at the small tin-roofed building in Santiago de Cuba it came to symbolize the birth of the world’s first premium white rum. Over the decades ‘El Coco’ flourished through all weathers and natural disasters. It also survived the distillery’s expansion, when the building was built around it. But after the Cuban Revolution overthrew Fulgencio Batista on January 1, 1959, ‘El Coco’ started to wither and die. On October 14, 1960, six months after the palm tree died, the government seized Compañia Ron Bacardí SA’s assets. The penniless family fled in exile, but fortunately the Bacardi trademarks and formulas were safe outside the country. Gradually the family rebuilt the company and today it is the largest privately-held spirits company in the world, operating 27 production facilities in 16 countries. ‘El Coco’ remains an enduring symbol of Bacardi’s heritage and survival. It is also a mascot for good fortune and is the emblem for the company’s core value of Caring. Every time Bacardi moves to a new premise, a coconut palm is added to the grounds. Decanters containing the 150th anniversary Ron BACARDI, de Maestros de Ron, Vintage: MMXII also feature ‘El Coco’. A palm design is engraved onto the stopper.